“Over 1,400 years ago, Chinese people built the first known stone arch bridge in an epoch we do not readily think of as technological. Now, in an age when the prominence of technology cannot be denied, the glory of those bygone civil engineers has been recreated through 3D printing technology. 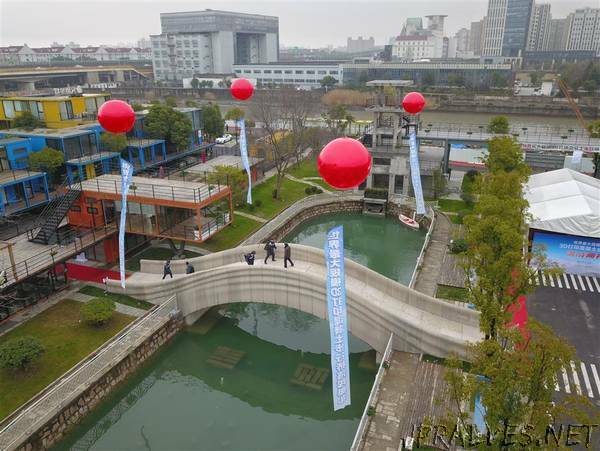 Two 3D-printed bridges — the world’s largest 3D-printed concrete pedestrian bridge in Baoshan District and a resin bridge in Putuo District ­— have brought technology more widely used in education, medicine and the automobile industry into architecture and construction. The technique is much faster and cleaner than the alternatives. The bridges are both more durable and cheaper than conventional construction techniques, according to Xu Weiguo, an architecture professor with Tsinghua University, who built the Baoshan bridge. The 26.3-meter bridge across a canal in Wisdom Bay Innovation Park on the Wenzaobang River was completed on Saturday. It resembles the Zhaozhou Bridge, built in north China’s Hebei Province during the Sui Dynasty (581-618) and still used by pedestrians today. Construction of that bridge began in 595 and took 11 years. The technology used to duplicate the famous bridge has made it much cheaper than any conventional structure could aspire to be and not one steel bar was used, said Xu. Two robotic arms developed by Xu’s team worked for only 450 hours to build it. The 3D-printed bridge is not remarkable for the printing technology alone: Sensors and other gadgets have been installed to monitor displacement and ensure safety. Data accumulated will be valuable to future designers, said Xu. Over 100 guests were invited to take a first stroll across the bridge on Saturday. “It’s beautiful! Just like the rainbow bridge in fairy tale books,” said Lin Siqi, an elementary school student who lives nearby. “But the arch is a little too steep for me,” she added. The park, formerly a container yard, opened in 2015 and many old containers have been converted into offices and workplaces. It is home to the China 3D Printing Museum and a number of high-tech companies focused on 3D printing, intelligent manufacturing, virtual reality and artificial intelligence. The other 3D-printed bridge spans a river in Taopu Smart City, a high-tech business district. The 15-meter S-shaped bridge was made in 35 days by a giant 3D printer. It was unveiled on Friday.